Here you can set the position of a feed on the time line when it is created. Opens a dialog where the position can be configured. 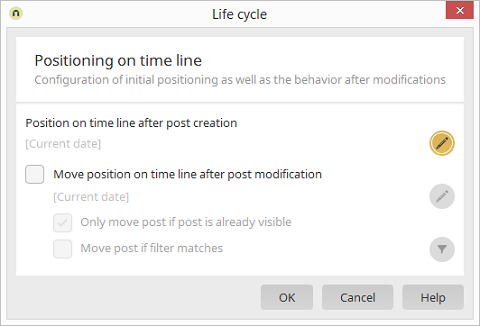 With this option, an existing post, which is positioned lower on the timeline, can be moved to a different position as a result of a change in a data record. Opens a dialog where the new position can be configured. Means that only posts, which are already visible in Intrexx Share, will be moved when a change is made to the data record. A filter can be defined as an additional criterion as to when a post should be moved on the time line. Opens a dialog where a filter can be created.